That was my New Years Tweet (yes, I am on twitter, you can follow me if you like). It was kind of a toast/blessing for 2010. The love part has obvious implications. I want to keep loving my family and friends, myself, and my life. Loving myself includes taking care of my mind, body, and spirit. For me that is sewing; more broadly creating. 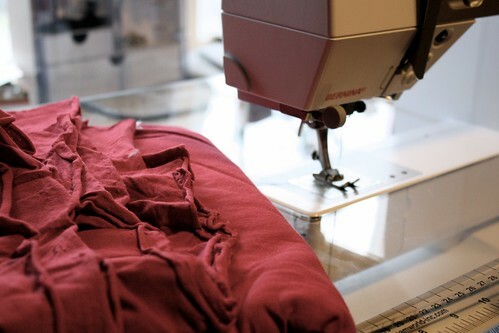 I feel so good when I am actually sitting in front of the sewing machine and doing it. Of course it is always thrilling to pick out fabric. And who doesn't love seeing something you have made finished? But just sewing for me is really lovely and relaxing. The bravery part goes deep for me, but one think I will say here at BN is that I am going to sew more knits. I know this is not hard. I have dabbled in it through the years, but this year I am totally inspired by this pattern and this idea. Simple knits are where it is at for me. I may even take Sally's T-shirt class someday to gain the confidence to pop the ballpoint needle in my machine and see what all those custom knit stitches are about. Bravery is a big one in sewing. So often people are intimidated by two areas of sewing: cutting and actually pressing the presser foot down to sew. The fear of sewing is evident on some students faces during class and can really take the fun out of sewing. Yes, cutting is something to be focused on, but really, what is the harm done? 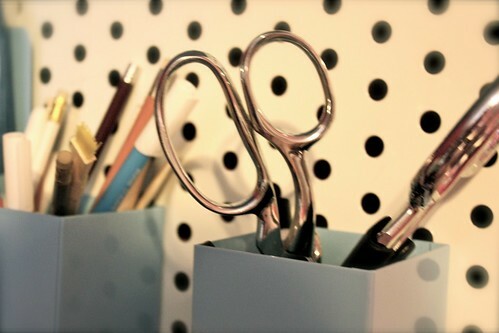 About the worst think that can happen cutting is that you will cut totally wrong and have to start anew. That isn't so bad (depending on the price of your fabric), and actually, you may really learn something. As for sewing a seam, they are easyily removable, it may just take some extra time. But really, in life we learn from our mistakes not our successes. So be brave! Cut! Sew! Happy New Year, we have missed you.